People: Arabs; seven million of the total population are foreign workers. Languages: The official language is Arabic, although English is widely spoken in business circles. Membership of international groups/organisations: World Trade Organisation, Arab League, Gulf Co-operation Council, Organisation of the Islamic Conference and United Nations and Organisation of Petroleum Exporting Countries, IMF and World Bank. Flag: The flag of Saudi Arabia bears the Muslim creed: 'There is no God but God: Muhammad is the Messenger of God.' The official emblem is a date palm, representing vitality and growth, and two crossed swords, symbolising justice and strength rooted in faith. The Foreign and Commonwealth Office recommends visitors check that their immunisations for polio, tetanus, and hepatitis are up-to-date before visiting Saudi Arabia. There have been cases of Rift Valley Fever (RVF) in south-western Saudi Arabia (mainly in the Jizan area) and also (but only in Jizan itself) cerebral malaria. The outbreaks of cerebral malaria are local and do not affect Jeddah or any other area of the country. Visitors to Jizan Province should take appropriate precautions. During the period of Hajj and Umrah, visa requirements for Saudi Arabia require pilgrims to have a valid certificate of vaccination against the ACWY strains of meningitis. Visitors may be refused entry without this certificate. For further details and requirements, please see Travel Advice for Saudi Arabia (http://www.fco.gov.uk/content/en/travel-advice/middle-east-north-africa/saudiarabia/fco_trv_ca_saudiarabia) and Hajj pilgrims (http://www.fco.gov.uk/en/travel-and-living-abroad/your-trip/hajj-pilgrims) . Islamic principles and social customs influence all aspects of life and society in Saudi Arabia and are strictly observed. The country adheres to the Islamic Sharia legal system. The Saudi working week is from Saturday to Wednesday, with Thursday and Friday as the weekend. With the largest proven oil resources in the world, Saudi Arabia is by far the largest world exporter of oil. Oil was discovered in 1938, and the then US-controlled Aramco (Arabian American Oil Company) began production. Saudi Aramco, nationalised since the 1980s, controls all onshore oil and has the largest reserve base of any company in the Exporting Countries (OPEC); it has always been the dominant player within OPEC in adjusting production in line with market stability. Large oil earnings, particularly since the oil price rises of the early 1970s, have allowed the Government to spend heavily on its people and on building the infrastructure of a modern economy. The Saudi economy is thus heavily dependent on oil earnings and the high level of Government spending they make possible: a large and varied private sector exists but remains vulnerable to fluctuations in the oil price and government spending. Economic growth was barely fast enough in the 1980s and 1990s to keep up with population growth, but very high oil prices in 2003-7 have made possible a strong spurt in growth. While oil prices have dropped from their highest levels the current stability of oil prices has helped the Saudi economy weather the global financial crisis very effectively. Foreign workers form the vast bulk of the private sector workforce. But with a rapid increase in the Saudi population, government policy is now focussing on the need to create more jobs for young Saudis. Economic reform continues: moves in recent years include opening some previously closed sectors of the economy, such as the gas industry, to investment by foreign companies. Upstream oil remains closed to foreign investment. In 2005 Saudi Arabia joined the World Trade Organisation. Modern Saudi Arabia was formed in 1932 when King Abdul Aziz bin Abdul Rahman Al Saud, commonly referred to as Ibn Saud, united different regions of the Arabian Peninsula into one nation. On 23 September 1932, Abdul Aziz was proclaimed King, and since then all Saudi Arabia's rulers have been his descendants. During his rule, King Abdul Aziz laid the foundations for the modernisation of his country. He began to build its infrastructure: first establishing roads, and basic communications systems, and later introducing modern technology and improvements to education, health care, and agriculture. King Abdul Aziz died in November 1953, and his eldest surviving son, Crown Prince Saud bin Abdul Aziz, succeeded him. The new King’s brother, Faisal bin Abdul Aziz, became Crown Prince. King Saud established the Council of Ministers and the Ministries of Health, Education and Commerce. In 1964, the Crown Prince succeeded to the throne as King Faisal and, to deepen links between Islamic nations, he travelled throughout the Arab and Islamic world. King Faisal’s half-brother’s son, Faisal bin Musai’d, assassinated him in 1975. King Faisal’s brother, Khalid bin Abdul Aziz, succeeded him and reigned until his own death, from a heart attack, in 1982. King Khalid’s brother, Fahd, who had become Crown Prince on King Faisal’s death, succeeded him. In 1986, King Fahd took the title ‘Custodian of the Two Holy Mosques’. Crown Prince Abdullah became King on 1 August 2005 after King Fahd’s death. Prince Sultan bin Abdul Aziz, half-brother of King Abdullah then became Crown Prince, until his death on 22 October 2011. Prince Naif, another half-brother of King Abdullah (and Minister of Interior), has been appointed the new Crown Prince. Saudi Arabia plays a critical role in the region. King Abdullah’s Beirut declaration of 2002, known as the Arab Peace Initiative (API), was a landmark, and remains important to the search for peace. An Arab League Summit in Riyadh endorsed the declaration in March 2007, and the Arab League re-confirmed it in 2008. In December 2008, the Arab League wrote to then President– elect Obama reiterating its support for the API and urging Obama to engage in the MEPP. The Saudis played an important role in bringing this about. King Abdullah also brokered the Mecca Agreement in February 2007 that formed a Palestinian National Unity Government. Saudi Arabia is committed to ensuring that the issue of Palestine remains a priority to the international community. Saudi Arabia supports the political process in Iraq, and strongly supports national unity there. It has a critical role to play in supporting Iraqi Prime Minister Maliki’s broad-based government, including through border security and the International Compact. Saudi Arabia fully recognises that the success of the revised Baghdad Security Plan is critical not only to Iraq’s future stability but to that of the entire region. Furthermore, Saudi Arabia’s Foreign Minister, Prince Saud, declared that Saudi Arabia is committed to cutting Iraqi debt. Saudi Arabia remains concerned about Lebanon’s instability, with its risks to the whole region, and has repeatedly called for a political solution to the country’s problems. A significant investor in the country, Saudi Arabia is the single largest donor to the Lebanon reconstruction effort. 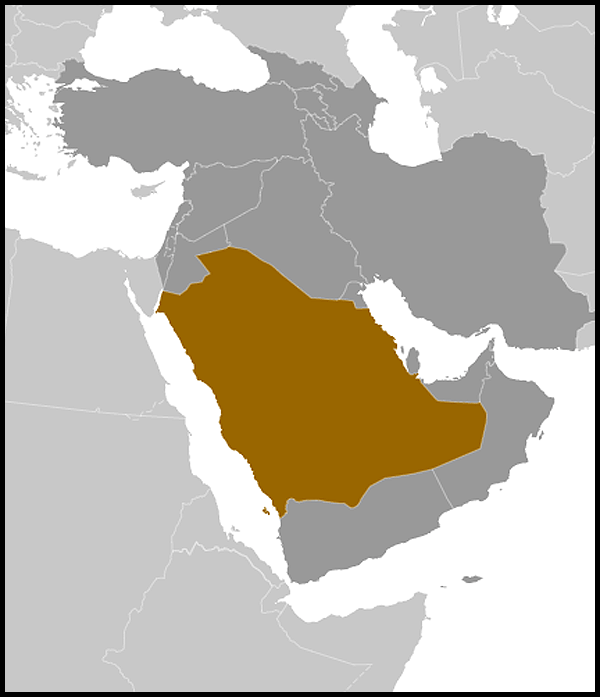 Saudi Arabia, Bahrain, Kuwait, Oman, Qatar, and the United Arab Emirates established the GCC together in 1981. It remains a forum for economic and political policy co-ordination. Saudi Arabia is one of the UK’s most vital partners in its global counter-terrorism efforts. The Saudi government stands firm against terrorism, and takes action against terrorists. The Saudi royal family were swift to condemn the terrorist attacks of 11 September 2001, and were one of the first countries to offer help to the UK after the 7 July 2005 attacks. The two holy cities of Mecca and Medina give Saudi Arabia worldwide religious importance, and the country is vital to world energy supplies. Saudi Arabia too has suffered from terrorism, and al-Qa’ida represents as much of a threat to Saudi Arabia as it does to the UK. The UK welcomes Saudi Arabia’s commitment to counter-terrorism co-operation, and works closely with Saudi authorities to develop a level of co-operation that delivers practical benefits to both sides. There are a number of cultural and educational links between the UK and Saudi Arabia. The British Council has an important English language and vocational training scheme in the country, and the number of Saudi students at UK universities continues to grow. There are 18,000 Saudi students studying degree and English courses in the UK. Saudi Arabia, as King Abdullah’s title - Custodian of the Two Holy Mosques – suggests, is home to the two most important sites in Islam: Mecca and Medina. Every year, millions of Muslims travel to Saudi Arabia to perform the Hajj and Umrah pilgrimages. In 1999, the UK became the first predominantly Christian country to organise an official Hajj delegation to assist the 20,000 British pilgrims. This delegation included members of the Foreign and Commonwealth Office and volunteers from the Muslim community. About the size of Western Europe, Saudi Arabia covers four-fifths of the Arabian Peninsula. The Red Sea lies on the West coast and the Persian Gulf, Bahrain, Qatar and the United Arab Emirates on the East. 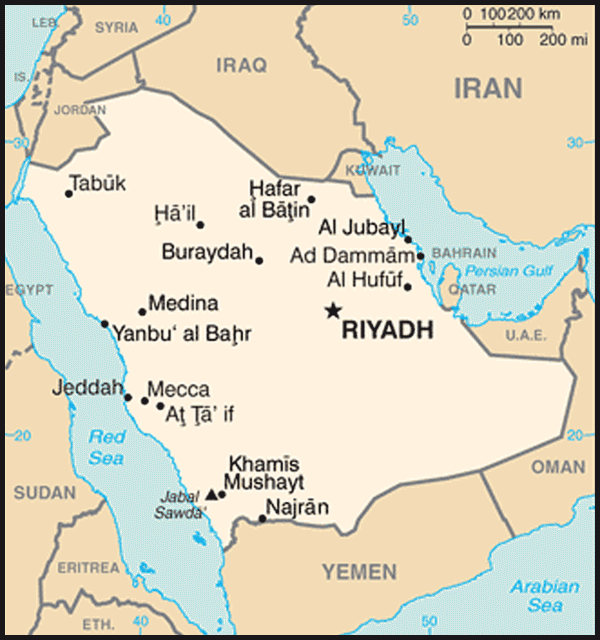 Saudi Arabia has borders with Yemen and Oman in the South, and Jordan, Iraq and Kuwait in the North. There are thirteen provinces. Most of the population is concentrated in Jeddah and Mecca in the West, Riyadh in the centre and Dammam and Al Khobar in the East. Saudi Arabia’s Empty Quarter is the largest sand desert in the world and is the size of France. Inland, summer temperatures can reach 50°C during the day, but can fall dramatically to below 30°C at night. In winter temperatures can be close to freezing in the desert. The coastal temperatures are more moderate, but humidity is high. Saudi Arabia is a Monarchy with a political system rooted in Islam’s Sharia law. The monarchy is directly descended from the founder of modern day Saudi Arabia. King Abdullah, the Head of State, is also the Prime Minister and nominates a Council of Ministers. His half-brother, Prince Sultan, is the Crown Prince. Other members of the King's close family hold important roles; these include Prince Naïf, appointed Second Deputy Prime Minister in March 2009. Between 1992 and 1993, King Fahd introduced a number of political reforms, including the establishment in 1993 of a Consultative Council, the Majlis Al-Shura. The Council has 150 male members appointed by the King. In addition there are 12 female advisers to the Council. The Council’s role is advisory. It debates and votes on new political legislation, but only the Council of Ministers can enact a law. In January 2003, the then Crown Prince Abdullah set out proposals for "self-reform and the promotion of political participation" in the Arab world. A few days later he received a petition signed by 120 people which called for reforms, including: election of members to the Shura council and regional assemblies; an independent judiciary; freedom of speech and association; the development of civil society and increased human rights; a greater public role for women; and a national forum for open discussion. In October 2006, the King announced the creation of an Allegiance Commission. Made up of senior members of the Al Saud family, the Commission governs the selection of a new King or Crown Prince if either of their predecessors should die. It also provides for the possibility of abdication in the event of medical incapacitation. King Abdullah’s most recent round of reforms took place in February 2009. These reforms included: four new cabinet ministers; new judges; new heads of governmental bodies including the Saudi Arabian Monetary Authority (SAMA, the central bank) and the religious police; 79 new members of the Shura Council (the fledgling parliament); two senior military appointments; and new religious figures. King Abdullah also appointed the first woman to hold ministerial rank in Saudi Arabia. Dr Nora al Fayez is now Deputy Education Minister for Girls’ education. As part of this reform process, the then Crown Prince Abdullah announced, in October 2003, a plan to hold municipal elections for half of the members of municipal councils. These elections were the first national elections in Saudi Arabia. Polling took place between February and April 2005. In 2009, the Cabinet announced that further elections would be postponed for two years, these took place on 29 September 2011, immediately after the announcement by King Abdullah that women will be allowed to participate fully in the next municipal council elections in 2015 (and will be eligible for appointment to the next session of the Shura Council in mid-2013. While there have been limited improvements in recent years, the UK remains deeply concerned about the Human Rights situation in Saudi Arabia, in particular over the use of the death penalty, women’s rights and the quality of judicial procedure. The UK Government remains committed to raising human rights with the Saudi authorities at every appropriate opportunity at working, Ambassadorial and Ministerial level. The UK, as a member of the European Union, strongly advocates the abolition of the death penalty in Saudi Arabia. The UK Government also recognises that the situation is slowly improving. There are now two semi-governmental human rights bodies in the Kingdom: the Human Rights Commission and the National Society for Human Rights. These institutions raise awareness of human rights in the Kingdom and help individuals by taking their concerns to the interested governmental body. Since 1996, Saudi Arabia has signed and/or ratified the following: The Convention on the Rights of the Child (CRC), 1996; the International Covenant on the Elimination of all Forms of Racial Discrimination (CERD), 1997; the Convention Against Torture (CAT), 1997; and the International Covenant on the Elimination of all forms of Discrimination Against Women (CEDAW) in 2000. 1. To enact and implement a Law of Association to guarantee the right to form civil society organisations and protect those organisations from government interference. 2. To abolish the guardianship system. This severely limits the rights of women to act as autonomous and equal members of Saudi society. 3. That the code of Criminal practice be amended to stipulate that only individuals over 18 years old will be tried as adults. As a result, the executions of any individuals who were less than 18 years old when they committed the crime should be commuted to a custodial sentence. Saudi Arabia is the UK’s most important partner in the Middle East, crucial to achieving our objectives on the economy, counter-terrorism (CT), counter proliferation, regional security, energy security, and climate change. It is the largest market for goods and services in the Middle East, a major investor in the UK, an important player on regional issues (including Iran and the MEPP) and a key defence and CT partner. The bilateral relationship is in very good shape. HM the Queen has been Queen of the United Kingdom during the reign of every ruler of modern Saudi Arabia. The links between the two royal families are immensely strong. At a political level the two governments are close and strategic partners on a range of issues. And perhaps most importantly of all there are extensive links between the Saudi and British people, from businesspeople, to pilgrims to student. The United Kingdom has significant political and commercial interests in Saudi Arabia. About 20,000 UK nationals live there, and the country is our largest export market in the region. UK exports to Saudi Arabia in the period January to July 2010 were approximately £1.7 billion. The UK is Saudi Arabia's joint fourth largest investor. Saudi Arabia has the world’s largest proven oil reserves and is the world’s largest supplier of oil. Saudi Arabia holds most of OPEC’s spare capacity and is vital to oil market stability. Aramco produces around 8 million barrels per day (mbd) and has a maximum sustainable production capacity of 11.3 mbd. This will rise to 12.5 mbd once all expansion projects are completed. In late 2008, due to concerns over the global economy and a desire to conserve oil wealth for future generations, the Ministry of Petroleum retreated from an earlier ambition to expand production capacity to 15 mbd by 2015. The Ministry has also said that it will review economic developments, and will invest in increasing capacity if demand projections require it. Saudi attitudes towards climate change are evolving. Although they maintain a hard position in international negotiations, they have recently become more accepting of the scientific arguments behind climate change and believe that international action is required. Saudi Arabia’s main objective is to make oil a ‘greener’ fuel, thus ensuring continued use of fossil fuels on which their economy depends. But renewable energy options are being explored: in December 2008, Oil Minister Naimi announced an ambition that Saudi Arabia should export solar energy as well as hydrocarbons. The Saudis have launched several low carbon initiatives, starting in 2007 with the establishment of a $300m fund for research and development into clean oil technology and carbon mitigation (Centre for Petroleum Studies and Research). The hope is that this will eventually develop into a $3bn fund. In late 2008, the Ministry of Petroleum published a Carbon Management Technology Road Map that outlines mitigation plans for carbon emissions and the re-injection of carbon dioxide to enhance oil recovery. The road map matches the UK’s ambition for co-operation on Carbon Capture and Storage (CCS) technology. The UK co-operates with Saudi Arabia, Norway, and the Netherlands on CCS through the Four Kingdoms initiative. Initiated by the respective Foreign Ministers to facilitate constructive dialogue between the two countries, the UK and Saudi Arabia launched the Two Kingdoms Dialogue in 2005. In the past, topics have included education and the role of women in business. In Riyadh in April 2009, the fourth and most recent meeting focussed on the impact of the economic crisis on trade and investment flows between the UK and Saudi Arabia. The Two Kingdoms Dialogue is to be upgraded to a full Strategic Partnership by the end of this year. This will enable greater engagement between the two Kingdoms and formally put the relationship on a par with that between Britain and other major global partners. Defence links are central to the bilateral relationship. Until 2003, RAF aircraft were routinely based in the Kingdom; since then, the military relationship has consisted of engagement in a variety of activities with the Ministry of Defence and Aviation, the Saudi Arabian National Guard and the Ministry of the Interior. Defence sales have also played an important role; the Al Yamamah Project, was, up to 2004, worth over £43 billion to the UK. The Salam project is currently delivering 72 Typhoon aircraft to the Royal Saudi Airforce.